One of the areas of Math that can be very hands on is that of measuring – whether you are ordering/sorting objects, using language of size, weighing, length etc. Here’s 3 fun ideas that you can do at home for some hands on math activities for measuring. First off some outdoor measuring fun from Rubberboots and elf shoes – this looks so much fun. I’m going to be doing this later this week on one of our walks. Cooking provides some great hands on measuring activities this post from Yummy Inspirations has some great Math concepts. Next a resource to printout for some hands on ordering that can be done when you need some quiet time/down time for the kids from Gift of Curiosity. Welcome back to this weeks Tuesday Tots – I am really sorry if you came to link up towards the end of the week and discovered the linky was down I hadn’t renewed the subscription – all sorted now. 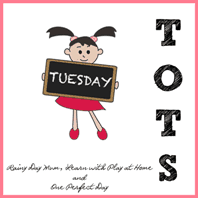 Tuesday Tots is held weekly on Rainy Day Mum, Learn with Play at Home and One Perfect Day. Each week we feature posts that have been linked up the week before as well as pin to our Tuesday Tots Pinterest Board. If this is your first time linking up to Tuesday Tots please pop on over and read the Tuesday Tots guidelines (there aren’t many). I look forward to visiting you sites next week seeing all of the fantastic ideas linked up. Thanks for featuring our post on measuring with sticks. Looks like some good ideas to check out this week.